Even by the standards of politicians, there has been an unusually widespread outbreak of hypocrisy following the announcement that Ian Paisley intends to resign after a year as First Minister of Northern Ireland. As political leaders in Britain and Ireland fell over each other in their anxiety to praise this great peacemaker, they sounded like abused wives piteously thanking their brutal husbands for having finally put away the stick. What made it more piquant was that among the laudatory chorus were Gerry Adams and Martin McGuinness, two brutal former terrorists, who also saw the light rather late in the day. But then the IRA have much in common with 81-year-old Paisley. Together, they bear much of the responsibility for turning a prosperous little province with soluble problems into a basket-case. "Ian Paisley has made a huge contribution to political life in Northern Ireland and the United Kingdom," said Gordon Brown. Well, yes, Prime Minister. But most of that contribution was malign. Don't you remember that for more than six decades, this roaring bigot played a vital part in fomenting sectarianism in Northern Ireland? "His has not been a career without controversy," admitted Irish Prime Minister Bertie Ahern, in an article praising this "honourable and courteous" man for his courage and leadership. You can say that again, Taoiseach, but it would be more honest to speak of his destructiveness. Charismatic, eloquent, energetic and malevolent, Paisley succeeded in splitting every organisation in which he became involved. Too arrogant ever to follow, he could only lead. Since Paisley's Presbyterian elders did not sufficiently hate the Roman Catholic Church, he founded the Free Presbyterian Church of Ulster in 1951, which refused to have anything to do with Roman Catholics for fear of religious contamination. Paisley remained head of this fundamentalist sect until last year, denouncing the papacy all the time while behaving like a pope himself. In politics, such a man could not be content with being a humble member of the Unionist Party - he wanted to lead. So Paisley split unionism with his Protestant Unionist Party, which in 1971 became the Democratic Unionist Party (DUP) that he still leads today. It was Paisley who became the biggest hurdle to a peaceful accommodation between Catholics and Protestants, nationalists and unionists. He denounced as traitors those unionist politicians who wanted to react constructively to the predominantly Catholic civil rights movement of the late 1960s. It was out of this movement that the Provisional IRA was born, and who knows what bloodshed could have been avoided if only Paisley had not prevented unionists from responding sensibly? A brilliant orator, who persuaded generations of gullible, ill- educated loyalists that to compromise was to sell out, Paisley's first major political scalp was Ulster Prime Minister Terence O'Neill in 1969. Seen as too conciliatory towards the Catholics, he was challenged in his own constituency by Paisley, who came close to beating him. The humiliation helped to force O'Neill from office. His last scalp belonged to that very considerable man, David Trimble, who in 2005 lost his Westminster seat to one of Paisley's candidates because he was prepared to accept the power-sharing deal with Sinn Fein that Paisley agreed, without embarrassment, two years later. Although Paisley has never endorsed killing, and therefore was not as bad as the IRA, he spread paranoia and hatred - and then washed his hands when some of his audience became over-excited. Many loyalist paramilitaries have said they would never have become involved in violence had they not been inspired by the inflammatory rhetoric of Ian Paisley to counter the twin enemies of Rome and the Republic of Ireland. Certainly, the IRA leadership, whose mission was to destroy Northern Ireland, saw Paisley as one of their best recruiting sergeants. They murdered moderate unionist politicians, but they never made an attempt on the man who said "Never, never, never" to any proposals to reconcile the two tribes of Northern Ireland. Yet this is the man who is now praised as an icon of reconciliation. "The established peace and continuing prosperity which everyone in Northern Ireland now enjoys owes a significant debt to the leadership of Dr Paisley," we are told by Shaun Woodward, Secretary of State for Northern Ireland. Martin McGuinness, Deputy First Minister and a former Chief of Staff of the IRA, who only a few years ago would have been described by Paisley as the "spawn of Satan", says: "I think he will be fondly remembered by the people of Ireland, north and south, for the very courageous leadership he showed." But should we not at least rejoice that Paisley saw the light? Is it not wonderful that in Belfast, Dublin, London, Brussels and Washington both he and McGuinness have shown themselves to be so smiley and chummy that they became known as "The Chuckle Brothers"? And is it not commendable that Paisley is leaving office voluntarily rather than clinging on? 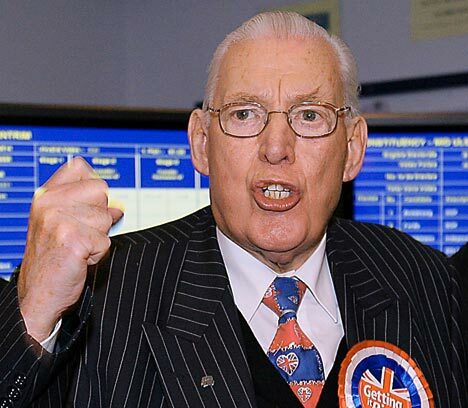 I hate to rain on an old man's parade, but Ian Paisley deserves a torrential downpour. What made him change his tune was a longing for power, fame and adulation, but then his whole career has been driven by his colossal ego and craving for the spotlight. When the DUP and Sinn Fein emerged as the two biggest parties after elections in 2003, Paisley was still saying "No" to any power-sharing deal, but he knew he had a simple choice. He could follow the advice of his deputy, Peter Robinson, and most of his colleagues and ultimately go into government with Sinn Fein, or he could refuse on principle and risk splitting his party or being toppled. There was never a contest. Negotiations about devolution ground on and Paisley never walked away. Although as late as 2006 he was assuring his followers that Sinn Fein would be in government over his dead body, gradually the prospect of ending his turbulent career as top dog in Northern Ireland proved irresistible. In addition, he fell victim to the vanity that so often afflicts old men. Sweet-talked by those two great flatterers, Bertie Ahern and Tony Blair, he succumbed to their entreaties, as he would later succumb to the calculated, sinister charm of Martin McGuinness. Ian Paisley is leaving office because he has little option. Although his reputation was crucial in selling the deal to hardliners, a recent by-election showed a groundswell of deep disillusion at what is seen by tens of thousands of his religious and political followers as his treachery. There is a deep loathing in the heartlands for the "Chuckle Brothers" routine. And his son, Ian, who was a junior minister and his father's minder, had to resign because of some squalid financial dealings and Ian Senior knows he cannot operate without Junior's eyes and ears. The truth is that Paisley's modernising colleagues wanted him out and he knew his time was up. With Peter Robinson in charge, Sinn Fein will be kept at arm's length, and the mainstream DUP will try to reach an accommodation with the moderate Ulster Unionists. Shed no tears for Ian Paisley. He did what he did for Paisley. Not for peace.